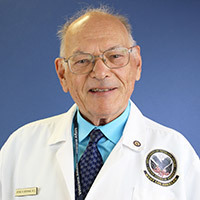 Jerome M. Hershman, M.D., M.S., MACP is Distinguished Professor of Medicine Emeritus at the David Geffen School of Medicine at UCLA and Director of the Endocrine Clinic at the West Los Angeles VA Medical Center. He was the Editor of the journal Thyroid from 1991-2000 and now edits the online journal Clinical Thyroidology. He received a B.S. in chemistry from Northwestern University, M.S. in chemistry from the California Institute of Technology, and M.D. from the University of Illinois School of Medicine in Chicago. He was a resident in internal medicine at Beth Israel Hospital in Boston and the Boston VA Hospital and trained in endocrinology at the Tufts New England Medical Center. Dr. Hershman was a faculty member in the Department of Medicine at Northwestern University for 3 years, then at the University of Alabama in Birmingham for 5 years before moving to UCLA in 1972. He has authored over 350 research papers in endocrine literature and written 140 authoritative book chapters and reviews about thyroid function and disease. His current research focuses on the pathogenesis and management of thyroid cancer.